The United States launched a blistering verbal attack on the International Criminal Court (ICC) and threatened sanctions against its judges if they proceed with a probe into alleged war crimes by Americans in Afghanistan. John Bolton, President Donald Trump’s national security adviser, made the announcement in a speech to the Federalist Society, a conservative group, in Washington, DC, on Monday. “Today, on the eve of September 11th, I want to deliver a clear and unambiguous message on behalf of the president. The United States will use any means necessary to protect our citizens and those of our allies from unjust prosecution by this illegitimate court,” Bolton said. In 2016, The Hague-based court said members of the US armed forces and the CIA might have committed war crimes by torturing detainees in Afghanistan. Established in 2002 under the Rome Statute, the ICC is the world’s first permanent court set up to prosecute war crimes, crimes against humanity, and genocide. More than 120 countries are members, but superpowers - including the US, Russia and China - have not signed up. On the ICC, Bolton said if any investigations go ahead on alleged US war crimes, the Trump administration will consider banning judges and prosecutors from entering the country, put sanctions on any funds they have in the US financial system, and prosecute them in US courts. Bolton said the main objection is the idea that the ICC could have higher authority than the US constitution and US sovereignty. It was Bolton’s first major address since joining the Trump administration. He was previously the US ambassador to the United Nations during the George W Bush government and fought against the ICC in the 2000s. “The International Criminal Court constituted an assault on the constitutional rights of the American people and the sovereignty of the United States,” he said. 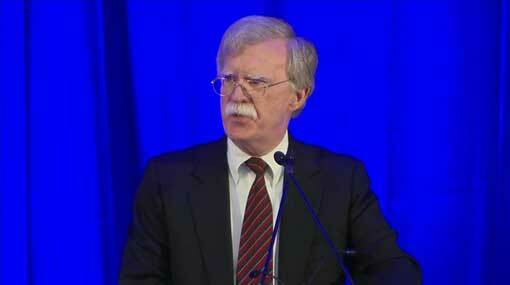 Bolton said the US would “not sit quietly” if the ICC came after it, Israel, or other US allies. Following Bolton’s remarks, the ICC said that would continue its work as an independent and impartial institution, backed by 123 countries. “The ICC, as a court of law, will continue to do its work undeterred, in accordance with those principles and the overarching idea of the rule of law,” it said in a statement. Bolton also announced the closure of the Palestine Liberation Organization (PLO) office in Washington, DC, because of the Palestinian attempt to get the ICC to investigate Israel for crimes committed during its decades-long occupation of Palestine. The national security adviser’s announcement drew applause from the conservative crowd but was sharply criticised by Palestinian leaders and officials. The action against the PLO is the latest in a series of measures by the Trump administration against the Palestinian leadership. “It is a declaration of war on efforts to bring peace to our country and the region,” PA spokesman Yousef al-Mahmoud was quoted as saying by Wafa news agency. PLO Secretary-General Saeb Erekat said in a statement the decision was “yet another affirmation of the Trump administration’s policy to collectively punish the Palestinian people, including by cutting financial support for humanitarian services including health and education”. A Palestinian academic based in the Swiss city of Geneva said the US move “should not come as a surprise”. “This is an additional measure that must make it very clear to the current and future Palestinian leaders that the US is not an actor to be ever trusted when it comes to any matter related to “peace” negotiation and talks. This is obvious to the Palestinian people, but not to the PA/PLO leadership,” said Alaa Tartir, programme adviser at Al-Shabaka: The Palestinian Policy Network.